After nearly two decades with McLaren, Pat Fry upped sticks and moved to Ferrari, joining the team in 2010. His position within the Scuderia ha changed several times as they continued to reshuffle the technology departments in the hopes of finding some performance. He was the director of engineering up until the end of 2014, when he was ousted in yet another technical team overhaul. Ahead of 2016, Fry joined Manor as an engineering consultant. Pat Fry tinkered with motorcycle maintenance in his early years, and the passion for engineering translated to a career in motorsport. He joined Benetton in a development role but soon moved to an engineer role, firstly with the test team and then as race engineer for Martin Brundle in the early 1990s. Fry was asked to join McLaren by former colleague Giorgio Ascanelli, and he brought with him a wealth of knowledge about active suspension, having worked on the Benetton project. When the technology was banned, he returned to his race engineer roots and guided both Mika Häkkinen, David Coulthard, and members of the test team as well. Gradually, he was promoted through the ranks until he opted to leave Woking and join Ferrari. As Assistant Technical Director, Fry made his debut with the team in July 2010, and has weathered several department shake-ups. He became Head of Race Engineering when Ferrari reshuffled their employees after missing out on the 2010 title. 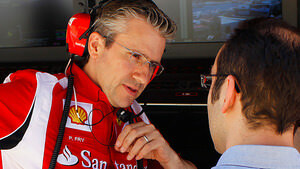 He became Director of Chassis when Ferrari did away with the single technical director role and spread the workload. Midway through 2013, Fry handed responsibility for the chassis to incoming James Allison, and was instead given a new position as Director of Engineering. He continued with the team for another year, but left the Scuderia in December 2014 after another desperate technical department reshuffle. After a season out of the sport, Fry joined the new Manor outfit as an engineering consultant, set to advise for the 2016 season. Unfortunately the team folded ahead of the 2017 season, leaving Fry without a role.